The big statement necklace with the REAL MELAMPYRUM FLOWER which combines bib and choker necklace. This artisan jewelry handcrafted by me of real plants only. I call it Grandma’s Garden Jewelry. Plants are covered with a durable crystal clear top layer. The coating stays clear during the all time, it will never become cloudy. And it protects natural flowers very reliable. Hand forged and hand painted with a patina process copper. The copper detail has a stylish rustic texture. Surface is quality polished . 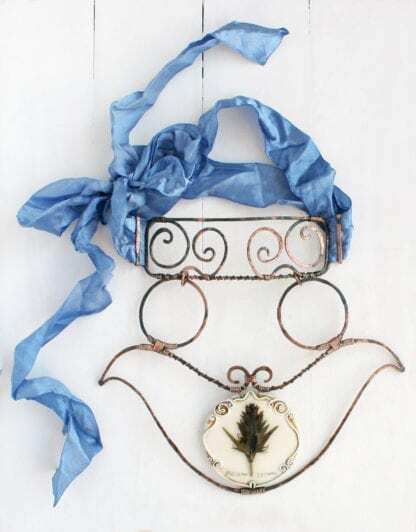 Necklace is easily adjustable for any size using blue gentle satin ribbon.